On Saturday (November 4) Melissa George was at the Kennedy Marquee on Derby Day held at Flemington Racecourse in Melbourne, Australia. 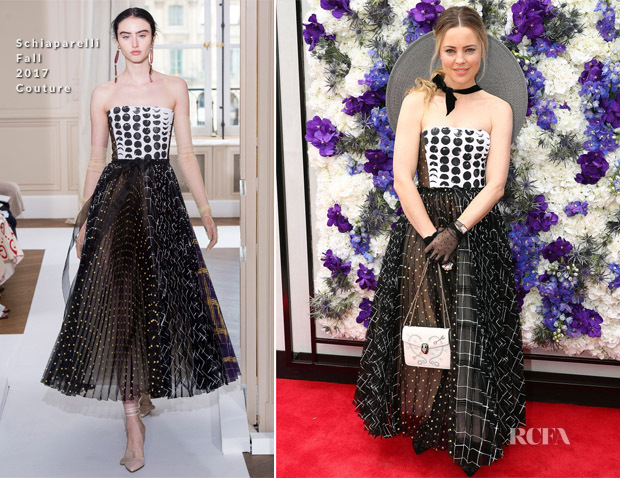 The actress is a regular in the front row of Schiaparelli Paris Fashion Week shows, so I wasn’t surprised to see her wearing a look from the brands Fall 2017 Couture collection. I was, however, thrown by the styling, as it feels like there’s one thing too much going on here. I like the hat – it was Derby Day after all – but I think the bag and perhaps the lace gloves were a tad overkill.